When selecting items for our kit, we wanted only the best, highest quality products available. 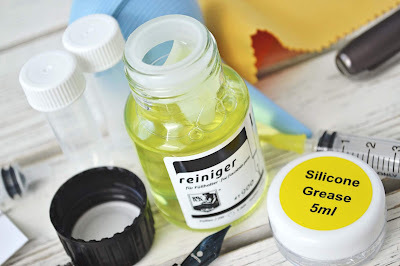 Other cleaning kits can be found across the web that include larger bottles pen flush, but nothing quite compares to "Reiniger" from Rhorer & Klinger. The Rhorer & Klingner "Reiniger" Fountain Pen Cleaner was specially developed for the absolute best maintenance for your fountain pen. It removes persistent stains while being gentle to sealings and the pen feed. Also, to offer the most convenient handling, each bottle is equipped with a Rohrer & Klingner "erka-rapid" intra-bottle inkwell. Not every fountain pen enthusiast is an experienced user. So, included with every kit is a half-page, easy to follow 5-step cleaning instruction sheet. The instructions make this kit a must-have for fountain pen beginners, but also a great reminder for those that have been using fountain pens for years. 1. Remove the cartridge/converter and flush the nib section with clean, cool water. Never use hot water as it can damage the nib. Use the faucet’s power, or the Bulb Syringe to force water through the nib and feed. If using the Bulb, fill it with clean water and carefully insert it onto the feed (where you would insert a converter/cartridge). Then, gently squeeze the bulb to send water into the feed, and out of the tip of the nib. Repeat until the water runs clear. 2. Fill or soak the nib section with Pen Flush, and let sit for at least 5 minutes (the Pen Flush helps to break up any remaining ink). Use the Vials for soaking nib sections and converters (the Vacuum Syringes work great to fill the Vials). Repeat if necessary. 3. Repeat step 1 to remove any remaining Pen Flush. 4. Allow the nib section and converter to dry completely before refilling with ink. 5. Once your pen is clean and dry, use a small amount of Silicone Grease to assist with any tight threads and use the Polishing Cloth to make your pen shine like new. Click Here to find the iPenstore Fountain Pen Care and Cleaning Kit on ipenstore.com, as well as hundreds of other great fountain pen products!